Are you lost and confused about Search.searchjsmtmp.com? If you are, we are here to rescue you. Have you been tricked into installing this search tool and setting it up as your search provider, homepage, and/or New Tab page? This might be easier to do than you think because the hijacker could be presented in a highly attractive manner. Was it introduced to you alone? That is unlikely. It is more likely that you were offered to download an extension that was bundled along with the hijacker. All in all, whether it was installed alone, or along with a bunch of other programs, you should really consider deleting Search.searchjsmtmp.com. Why is that so? Doesn’t it offer trustworthy search services? Not exactly. In fact, you might be putting yourself at risk by interacting with the search tool attached to the hijacker. Learn more about that, as well as the removal of the threat, by reading this report. We must talk about the distribution of Search.searchjsmtmp.com because it is important to figure out if other threats exist. The hijacker is presented by Polarity Technologies Ltd., and our research team has already reviewed hundreds of hijackers linked to this company, including Search.heasysportsaccess.com, Search.search4ppl.com, Search.searchidd.com, and Search.searchjmt.com. In most cases, extensions created by the same company are set up to trick Chrome, Firefox, and IE browser users into letting in these hijackers. At this time, however, an extension that would promote Search.searchjsmtmp.com does not exist. It is possible that another hijacker is about to give up its place, and if that happens, our best guess is that Search.searchjsmtmp.com would replace Search.searchtmp.com. This one has the same interface, but, at the moment, it is connected to the “Track My Package” extension. If you end up letting in the hijacker via an extension, you will need to remove it to get rid of the hijacker. What is so attractive about Search.searchjsmtmp.com? Although it is classified as a hijacker, there is no doubt that some users might find it attractive. First of all, it presents easy-access links to usps.com, ups.com, fedex.com, and dhl.com sites, which can be helpful if you manage lots of packages daily. Well, you could easily add links to these sites to your browser’s bookmarks bar. Since there are only four of them, you definitely should find place for that. What about the search tool? That is the feature that confuses most users. Search.searchjsmtmp.com redirects all searches to search.yahoo.com, a well-known search engine that delivers useful and reliable results. The hijacker reads your search queries, and then it injects related sponsored content accordingly. It is difficult to say who controls the injected links, and who can pay money to have their links shown. One thing’s for sure: You have to be cautious about malvertising scams. What is malvertising? It is a tactic using which schemers can trick gullible and careless users into interacting with unreliable links that route to malicious pages. There is one advantage to using Search.searchjsmtmp.com, and that is the easy access to four legitimate sites. Is this worth the security risks you could be facing by interacting with this search tool? Of course, it is not, and we strongly encourage you to delete the hijacker immediately. If your homepage and/or search provider were taken over, the guide below should assist you. If the threat took over New Tab as well, the chances are that an application or an extension is involved, and if that is the case, you must eliminate it first. Our research team is working hard to help you protect your systems against malware, but the reality is that no one can help you better than legitimate anti-malware software. Although you can remove Search.searchjsmtmp.com without facing consequences, there are far worse infections out there. Needless to say, it is high time you took care of your own security, and we hope you take this opportunity. N.B. If the hijacker was installed along with an extension, you need to delete it. On Chrome, you can do that via the “chrome://extensions” menu. On Firefox, via the “about:addons” menu. Internet Explorer users have to uninstall the application representing the extension via the Control Panel on Windows. Launch Chrome and tap keys Alt+F. Select Settings and then click Manage search engines under Search engine. Remove the hijacker (before that, set the desired search provider). Go back and navigate to the On Startup menu. Remove the hijacker and then set the desired start page. Launch Internet Explorer and tap keys Alt+T. Choose Internet options and then click the General tab. 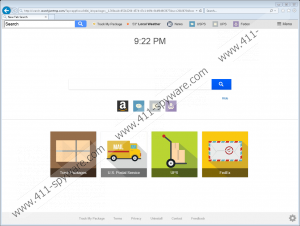 Erase the URL of the hijacker under Home Page, enter the desired URL, and click OK. Tap Alt+T, select Manage add-ons, and then go to Search Providers. Remove the hijacker (before that, set the desired search provider) and click Close. Select Options and then move to the Home menu (select on the left). Remove the hijacker’s URL in the Homepage section and then enter the desired URL. Move to the Search menu (select on the left).